Support the interoperability to ease the adoption of the e-Invoicing Regulation , in particular European eInvoicing standard (EN). The project will use the eInvoicing tools of the powerful and mature platforms of the EDI Providers of the consortium (EDICOM) to ease the adoption of the eInvoice Directive by the thousands of clients from the public and private entities in the healthcare sector, including for those participating in HOSP&INVOICE consortium. Updating EDICOM communication plan to business, public authorities and other stakeholders in the healthcare sector, based on a successful deployment of the solution during the project to several hospitals (operating eInvoicing solutions of the consortium) from several European countries (Belgium, Poland, Austria,Hungary and Italy). Business Development to ensure the sustainability of the action. 36 Hospitals from different Member States will integrate eInvoicing tools in their ERP, using resources already deployed to reduce cost and amplify the impact around Europe. This objective includes to update the market analysis and business plan to ensure the sustainability of the project by using the hospitals of this project to engage new public authorities after the end of the project. As this project is an initiative promoted by one of the biggest European eInvoicing provider with thousand of clients around Europe, also demonstrated by the transnationality of this consortium, HOSP&INVOICE has this plus for implementing a sustainable business model around all Europe. This will result in the upgrade of the eInvoicing tools of the EDICOM B2B Cloud Platform for complying with the eInvoicing Directive in the healthcare sector. The solution includes the automatisation of compatibility of official models of electronic invoices from each Member State and also manages the complexity of semantic interoperability stated by the eInvoice Directive. Mass adoption of electronic invoicing within the EU leads to significant economic benefits and an increase in European business competitiveness. Supported by European legislation, acceptance of eInvoices by governments will make it easier to do business with the public sector. The activity includes the overall project coordination; it will also support the administrative tasks of other beneficiaries and guarantee that all control and reporting mechanisms are being applied according to the Quality Assurance Procedures. This activity will be carried out for administrative, financial and contractual management of the consortium. The main objective of the project management is to deliver the Project Management Guidelines containing all the management and quality assurance procedures to be applied with the aim to ensure the execution of the project in conformity with the Grant Agreement and the Consortium Agreement. These guidelines will be created by updating the guidance documents of the last two eInvoicing actions coordinated by EDICOM according to the specific needs of the beneficiaries of this Action. 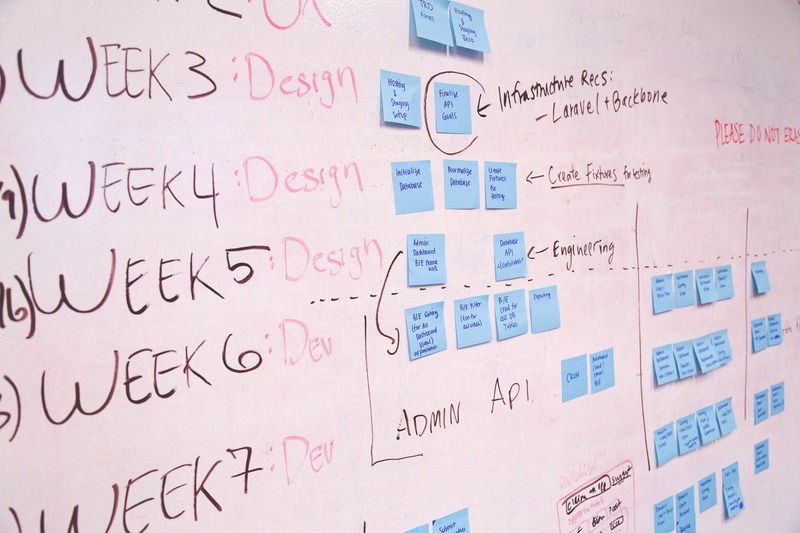 Also, the project management aims for promoting and enforce the action's quality assurance procedures, provide administrative assistance to the partners, ensure that all aspects of the action fit into the objectives of the CEF eInvoicing DSI, provide financial and contractual management of the Consortium. In this sense, project progress monitoring and overall technical coordination will ensure quality of the working processes and goal reach. The administrative project coordination will be leaded by VALTIVA, EDICOM and UPV, this task will include the ensurance of day-to-day management of the project, the document production and information exchange and project reporting and liaison with INEA. Also, it will be carried out an organisation of meetings, including logistics, agendas, presentations and minutes, consolidation of inputs for the generation and update of the project handbook deliverable and consensus management and information circulation among the partners. 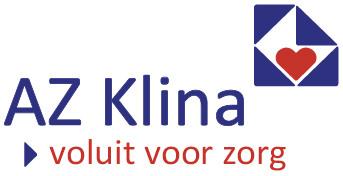 This activity will provide technical guidance and support to ensure the adoption of the European Standard on electronic invoicing for the Public Hospitals involved, considering their particular contexts and explaining how to receive the invoices from other Member States according to the eInvoicing Directive. It will present the implementation design to each hospital according to its own contexts. The main objective of the technical requirements and solution design task is to is to present the technical and legal requirements as well as the solution design to the hospitals. 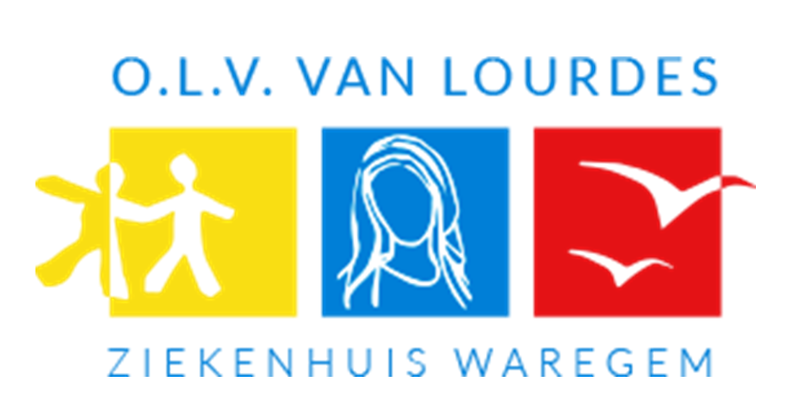 During the first three months, UPV and Valtiva will reuse the results of the technical and legal analysis from actions 2015-EU-IA-0058 and 2016-EU-IA-0096 to organize the technical guidance documents adapted to the needs of the hospitals of this Action, taking into account their actual eInvoicing procedures and solutions.In this task the implementation will be designed to present the necessary steps to be followed by each hospital in order to connect to the EDICOM Platform and to use the necessary tools to receive, validate and integrate in their own systems the electronic invoices originally issued in UBL and CEFACT/CII formats. UPV and Valtiva will support the other participants with the use of these guidance documents, especially about the technical requirements, the solution design and the specific contexts of each hospital implementation. Furthermore, guidance for implementation and the testing plan will be leaded by EDICOM; EDICOM will schedule and explain the technical implementation to the Belgian, Italian and Austrian hospitals of the consortium and Asseco will explain the technical implementation to the Hungarian hospitals ensuring that all hospitals will learn the operation of EDICOM eDelivery and eInvoicing services connected to their internal systems. EDICOM will also provide a testing plan to guide the hospitals since the beginning about what results are expected to demonstrate the successful implementation including the evidence of CEF conformance tests passed. This activity will be focused on the final tests for all implementations of the consortium, ensuring interoperability and promoting collaboration among beneficiaries for the cross-border transactions and for concluding the conformance tests. In this sense, this activity will supervise the results obtained during the implementation and will specifically carry out the tests coordinating all hospitals to guarantee the necessary quality to start the use of the European standard on electronic invoice in the production environments of the beneficiaries. The activity will involve laboratories under Consortium final tests. This task will carry out the testing between the consortium partners by exchanging test invoices to validate the use of the European standard by each consortium partner. In addition, the cross-border interoperability test will be carried out with another consortium that was selected under the CEF Telecom 2017-3 call, by exchanging invoices compliant with the European standard between the two eInvoicing platforms (EDICOM Platform and the Platform used by the Italian government). 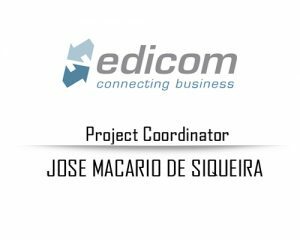 To facilitate this validation process, EDICOM will involve at least two European healthcare providers to generate and send invoices to each hospital according to the EN, facilitating the CEF conformance tests to be passed by each hospital. Finally, the final conformance validation of eInvoicing solutions where each hospital implementing the EN will carry out the conformance testing with CEF eInvoicing Core Service Platform to demonstrate the compliance with the EN Standard (and the supporting for both syntaxes UBL 2.1 and CEFACT/CII). 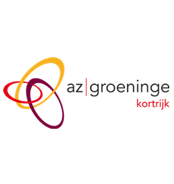 The activity consists of implementing the European electronic invoice in 36 public hospitals. Each entity will integrate into the Enterprise Resource Planning (ERP) software the semantic model of the European eInvoicing Standard, taking into account the specific requirements of the Member State in which the beneficiary (public hospitals) is established. The automated interoperation and intercommunication will be deployed for each hospital within the EDICOM B2B Platform and will also use PEPPOL and/or the EDICOM CEF eDelivery Access Point, according to the specific need of each entity and considering the characteristics of the healthcare sector. 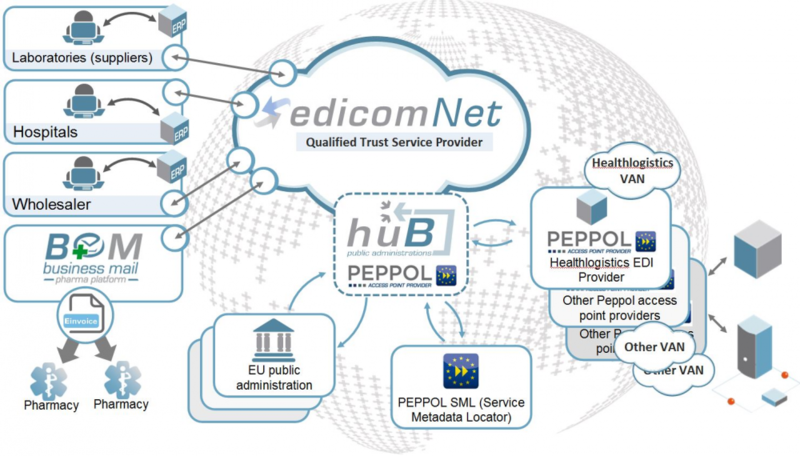 EDICOM will enrol the intercommunication tests for the cross-border exchange of the electronic invoices, having PEPPOL as one of the most important networks to be used by these hospitals (EDICOM, as a certified PEPPOL Access Point will connect all hospitals to PEPPOL Network). Integration of the electronic invoice in the ERP. Intercommunication between the ERP and the eInvoicing Platform. Map transformation and validation: configuration of the platform to support several standards and formats and to validate the invoices according to the entity needs. Intercommunication with other entities via EDICOM Platform, also using PEPPOL. Tests enrolment to be implemented by the specific interoperability cross-border tests activity. 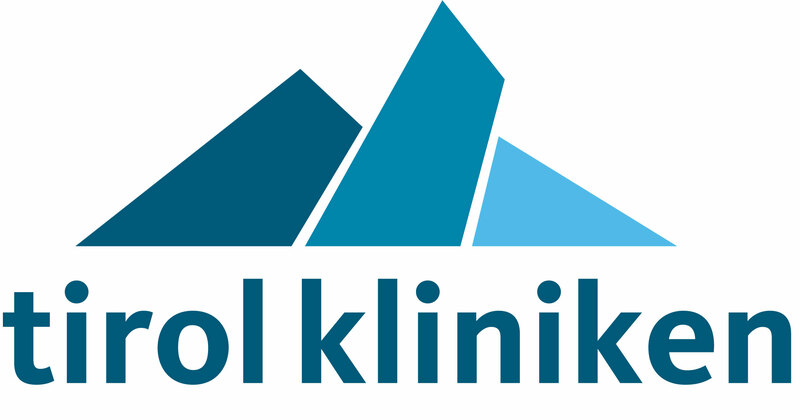 The dissemination will focus on using the exploitation plan to make a sustainable project in the future by promoting the adoption of the EN by the providers of these 36 hospitals as well as by new hospitals around Europe. 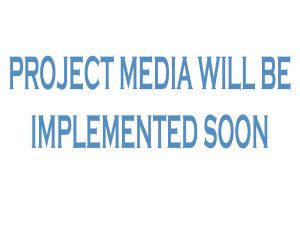 The dissemination will be promoted by each beneficiary of the consortium when contacting their own clients/business/research partners. The communication related tasks will amplify the visibility of the Action using several channels to ensure a large project communication to a wide number of potential users around Europe. All the documents and other initiatives related to the communication and dissemination of the Action may also include references to actions 2015-EU-IA-0058 and 2016-EU-IA-0096, trying to optimize the results for all CEF eInvoicing actions led by EDICOM and always identifying the different hospitals and Member States involved in each one. Communication will amplify the visibility of this project using several channels of diffusion. This is a crucial part of action for ensuring a large project communication to a wide number of potential users around Europe. It will seek to build a powerful database of stakeholders and potential users of the platform supporting the efforts to the exploitation plan and dissemination. 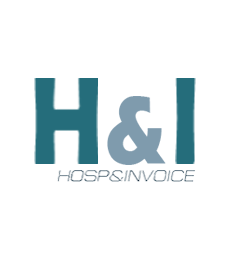 HOSP&INVOICE project has already started!